This weekend sees State of Origin officials camped under their respective selection caps. But as The Roar‘s BigJ can attest, any list smothered in Steeden is subject to slice, dice and rank whenever the fans choose. So before the interstate storm clouds gather, here’s an alternate selection of NRL talent that either gets me through the gate or raking for the family remote on a weekly basis. Name me a current player more watchable than Jordan Rapana and I’ll blast Eagle Rock through the Bruce Stadium Viking horn. I mean, here’s a guy good enough to side-step his own sublime skills over a six-year period with just a handful of NRL games before his first as a Raider in late 2014. Today, it’s no surprise the Kiwi ranks highest for line-breaks, tackle breaks and tries. If he’s not standing up his opposite or skimming the in-goal from beyond touch then he’s blasting holes through centre field. 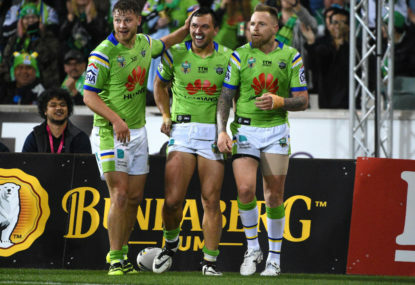 Even better for Ricky Stuart, the livewire sparks brightest when the Raiders chase points. He’ll muscle into dummy-half to inspire a tiring pack and still carry enough charge to pounce on the impossible. In today’s structured landscape, Rapana is pure wingman bliss, a mockery of the notion that claims fullbacks and centres occupy a financial rung above. To be honest, I didn’t realise the range of skills this former Rabbitoh possesses. Now back at home in the centres, Walker’s confidence is off the chart and Manly fans can thank his sizzle for several unlikely victories this season. More than twice the player he was when chosen for New South Wales, Walker’s gift is an uncanny anticipation that muddles his opponent’s mind long before they realise it’s time to chase. Already with two more line-breaks than he totalled last season, his instinct to assess then take the easier of the inside or outside line has risen to the fore. Just ask Jarrod Croker, who was cooked on the outside before Walker laid hands on the ball last weekend. The kind of blink and you’ll miss it moment that sunk the Roosters against the grain in Round 5. So much for the old bottle of wine analogy, Marshall was headed down the drain like last month’s green milk when Paul McGregor cleaned the decks at St George last year. Although Wayne Bennett has only used the Wests Tigers legend on three occasions this season, his skills remain undeniable. To me, Marshall is like the brash teenager who’s been told to pull his head in to the detriment of his natural instincts. Too often Marshall directs traffic when he can still pull a rabbit from the hat, just like his breathtaking final minutes against the Roosters. So long as his flame flickers, I’ll always find time to watch Benji Marshall. I suspect Suaia Matagi sleeps to the combative sounds of Mark ‘Spud’ Carroll and Paul ‘Chief’ Harrogan. Not since those two tried to alter the orbit of the Earth two decades ago have two men approached each other with the ferocity of Matagi and Martin Taupau in Round 1 at Brookvale Oval this season. Seated 30 metres away, I doubt my eyes stayed open such was the frightening acceleration of both men as the gap closed. How both recovered is best left to ballistic experts. In the weeks since, Matagi hasn’t altered course. Short in stature and all heart, the former Panther averaged 78 metres per game in 2016 but amazingly, now backs up weekly to crunch out more than 100. This one’s a little left field, but young talent on the rise can offer just as much joy as the superstars. With less than ten games under his belt, Jacob Liddle is a 20-year-old Tiger earning his stripes from the bench behind current No.9 Matt McIlwrick. Like most newbies, confidence isn’t an issue and the former junior rep always backs his pace from the ruck when the big men roll forward. With similar attributes to Jake Granville he’s one to keep tabs on, especially if Russell Packer and Ben Matulino bring their best in 2018. So Roarers, it’s now over to you, I want to read who tops your most watchable list.